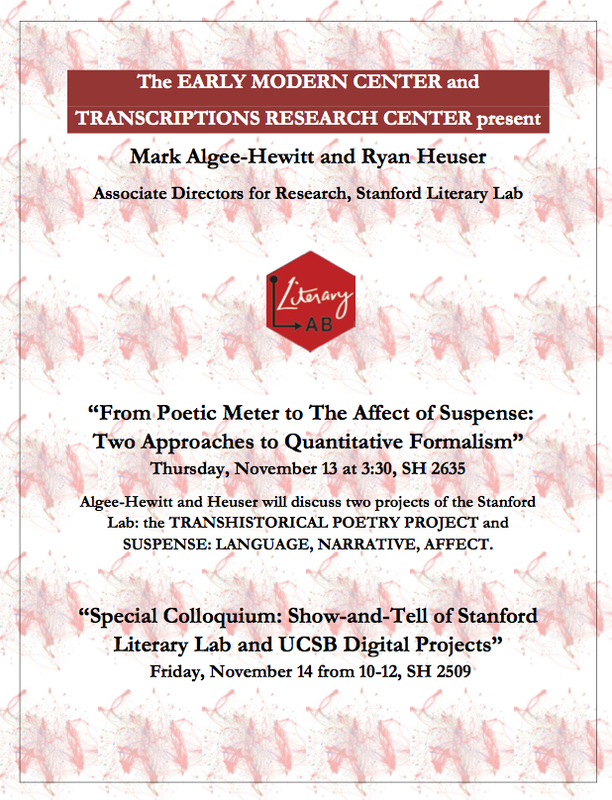 In the first half of this presentation, Ryan Heuser will discuss the Stanford Literary Lab’s Transhistorical Poetry Project. This study traces the variation of poetic form over a large corpus of English-language poetry, combining the insights of prosodic and metrical analysis with the methods of phonetics, natural language processing, and statistics. In the second half, Mark Algee-Hewitt will present the project Suspense: Language, Narrative, Affect. This project seeks to bridge the gap between the experience of suspense as it is felt by the reader in anticipation of impending events, and the formal features that may be responsible for producing this feeling. Does suspense work in the same way in every period and genre, and for all types of readers – or is it a highly individual reaction, promoted by techniques that vary according to time and place? The diverse group of researchers involved in this project are exploring these central questions – which lie at the intersection of language, narrative and psychology – via a detailed comparative analysis of “suspenseful” texts from 1750 to the present day. 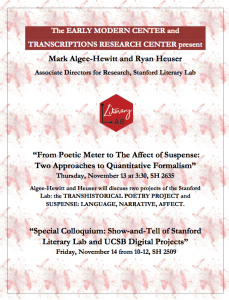 Then on Friday, November 14, at the Transcriptions Center, SH 2509, 10-12, there will be a special colloquium where Mark and Ryan, and the Transcriptions Center and EMC faculty will discuss their ongoing digital projects. Alan Liu will present on RoSE and the 4Humanities What Everyone Says About the Humanities Research Project (#WhatEvery1Says).